This curious Bible passage seems to indicate that, at the time it was written, the color of the terrible crystal was common knowledge because it was used to describe the color of the other strange objects. Before that we find the entity was in the Atlantean land when there were the preparations of those things that had pertained to the ability for the application of appliances to the various elements known as electrical forces in the present day; as to the manners and ways in which the various crafts carried individuals from place to place, and what may be known in the present as the photographing from a distance, or the fields of activity that showed the ability for reading inscriptions through walls - even at distances, or for the preparations of the elevations in the various activities where there was the overcoming of (termed today) the forces of nature or gravity itself; and the preparations through the crystal, the mighty, the TERRIBLE CRYSTAL that made for the active principles in these, were a portion of the activity of the entity in that experience. Einsteins's calculation was based on the idea of using the acceleration of mass to generate gravity waves. But, because of the equivalence of mass and energy in the theory of relativity, gravity effects can also be produced, theoretically, by light. Recently, my attention was drawn to an article in Physics Letters by Ronald L. Mallett3. The abstract for this paper reads, in part: “The gravitational field due to the circulating flow of electromagnetic radiation of a unidirectional ring laser is found by solving the linearized Einstein field equations at any interior point of the laser ring.” In this article Dr. Mallett describes a ring laser that generates a gravitational field. As shown in Figure 1, adapted from a figure from Mallett's paper, laser radiation is caused to propagate around a square path in space by being reflected from four mirrors placed at the corners of a square. FIGURE 1: Adaptation of Mallett's Figure 1 of the ring laser. 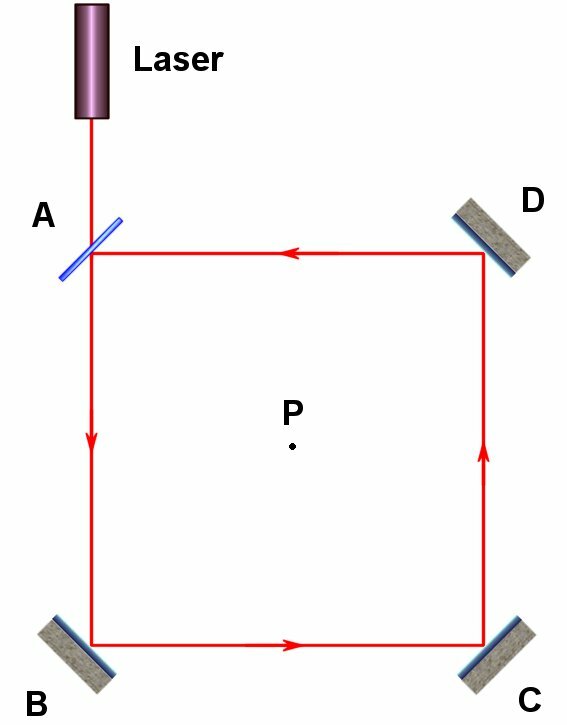 A laser beam enters through the semisilvered mirror at A, and then is reflected continuously around the square path formed by the mirrors at A, B, C, and D. The gravitational field is calculated for the center point P.
The final result obtained by Mallett is simple and easy to understand. Light orbiting around a point in space generates a gravitational field. This should not surprise anyone because the reverse effect has already been observed. Light from a distant star travels in a curved path when it passes near the Sun because of the Sun's gravitational field. At least, that is the explanation according to Einstein's General theory of relativity. It seemed to me that Mallett's article applies directly to the Tuaoi Stone. Figure 2: Diagram of the Tuaoi Stone ring laser illustrating total internal reflection. The incident laser beam enters the prism through a tiny facet which is oriented normal to the beam axis and located at one end of the prism. For this entity, then, - in the center upon a board or paper, - we would begin with the stone as the light of the activities in the temple in the Atlantean-Poseidian era. This might be termed the TUAOI STONE - T-u-a-o-i. This would be a six-facet stone of the height, as to proportion, with the rest of the chart as may be indicated. The STONE OF THE TUAOI would be opalescent, while the light would be indicated from the top in the rays of the white light. Note that "opalescent" presumably implies "showing changing colors like an opal," rather than any internal cloudiness of the crystal. (The Oxford Dictionary, American Edition). My assumption is that the “Tuaoi” were the priesthood responsible for the operation of the energy machines, just as “NASA” is the organization responsible for the operation of the Space Shuttles. If history repeats itself, TUAOI might even be an acronym for the name of an Atlantean organization. (Q) Going back to the Atlantean incarnation - what was the TUAOI STONE? Of what shape or form was it? (A) It was in the form of a six-sided figure, in which the light appeared as the means of communication between infinity and the finite; or the means whereby there were the communications with those forces from the outside. Later this came to mean that from which the energies radiated, as of the center from which there were the radial activities guiding the various forms of transition or travel through those periods of activity of the Atlanteans. It was set as a crystal, though in quite a different form from that used there. Do not confuse these two, then, for there were many generations of difference. It was in those periods when there was the directing of aeroplanes, or means of travel; though these in that time would travel in the air, or on the water, or under the water, just the same. Yet the force from which these were directed was in this central power station, or TUAOI STONE; which was as the beam upon which it acted. About the FIRESTONE that was in the experience did the activities of the entity then make those applications that dealt with both the constructive and destructive forces in the period. It would be well that there be given something of a description of this, that it may be better understood by the entity in the present, as to how both constructive and destructive forces were generated by the activity of this stone. In the center of a building, that today would be said to have been lined with non-conductive metals, or non-conductive stone - something akin to asbestos, with the combined forces of bakerite [bakelite?] or other non-conductors that are now being manufactured in England under a name that is known well to many of those that deal in such things. The building above the stone was oval, or a dome wherein there could be or was the rolling back, so that the activity of the stone was received from the sun's rays, or from the stars; the concentrating of the energies that emanate from bodies that are on fire themselves - with the elements that are found and that are not found in the earth's atmosphere. The concentration through the prisms or glass, as would be called in the present, was in such a manner that it acted upon the instruments that were connected with the various modes of travel, through induction methods - that made much the character of control as the remote control through radio vibrations or directions would be in the present day; though the manner of the force that was impelled from the stone acted upon the motivating forces in the crafts themselves. The preparation of this stone was in the hands only of the initiates at the time, and the entity was among those that directed the influences of the radiation that arose in the form of the rays that were invisible to the eye but that acted upon the stones themselves as set in the motivating forces - whether the aircraft that were lifted by the gases in the period or whether guiding the more pleasure vehicles that might pass along close to the earth, or what would be termed the crafts on the water or under the water. These, then, were impelled by the concentrating of the rays from the stone that was centered in the middle of the power station, or power house (that would be termed in the present). In the active forces of these the entity brought destructive forces, by the setting up - in various portions of the land - the character that was to act as producing the powers in the various forms of the people's activities in the cities, the towns, the countries surrounding same. These, not intentionally, were TUNED too high - and brought the second period of destructive forces to the peoples in the land, and broke up the land into the isles that later became the periods when the further destructive forces were brought in the land. Through the same form of fire the bodies of individuals were regenerated, by the burning - through the application of the rays from the stone, the influences that brought destructive forces to an animal organism. Hence the body rejuvenated itself often, and remained in that land until the eventual destruction, joining with the peoples that made for the breaking up of the land - or joining with Baalilal [Baal? Belial?] at the final destruction of the land. In this the entity lost. At first, it was not the intention nor desire for destructive forces. Later it was for the ascension of power itself. As indicated, [See 996-12] the records of the manners of construction of same are in three places in the earth, as it stands today:  In the sunken portions of Atlantis, or Poseidia, where a portion of the temples may yet be discovered, under the slime of ages of sea water -  near what is known as Bimini, off the coast of Florida. And  in the temple records that were in Egypt, where the entity later acted in cooperation with others in preserving the records that came from the land where these had been kept. Also the records that were carried to what is now Yucatan in America, where these stones (that they know so little about) are now - during the last few months - BEING uncovered. Note that numbers 1-3 in the last paragraph above were inserted following W. Hutton and J. Eagle's rendering on pp. 351-353 of their book, Earth's Catastrophic Past And Future--A scientific analysis of information channeled by Edgar Cayce.4 These authors made a study of all of the readings bearing on the location of Poseidia, the last large island to survive until the final destruction of Atlantis. Poseidia, in the heart of the Atlantean land, was -- according to Hutton and Eagle -- located in the vicinity of the mid-Atlantic ridge south of the present Azores Islands. There is also another way of interpreting this paragraph of 440-5, a way favored by Hutton and Eagle. It is that "the three places in the Earth" that are mentioned to hold the records that describe the construction of the great crystal are 1) ATLANTIS, consisting of (a) a temple in an area of sunken temples of Poseidia south of the Azores AND (b) a temple of the Poseidians in a portion of the land near Bimini; 2) EGYPT; and 3) YUCATAN. 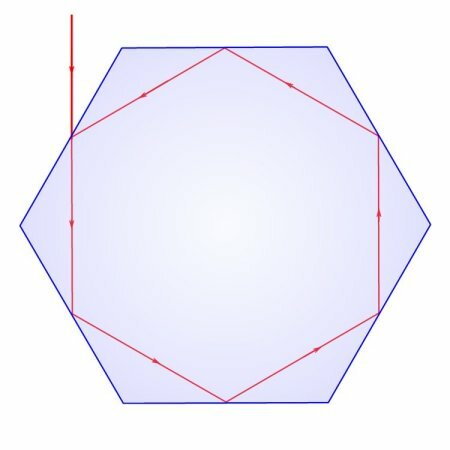 With the above in mind, then, the picture of the Tuaoi Stone which emerges is that of a large right hexagonal-cross-section transparent cylindrical prism, say, two meters in diameter and ten meters long. The six sides are ground and polished to the precision and finish typical of a fine optical instrument. The fabrication of such a behemoth to such tight tolerances seems impossible today, and would not have been easy for the Atlanteans either, but I believe that the Firestone was the ultimate technical achievement of the Atlanteans and it represents the culmination of generations of development. This huge machine is excited by an external laser directed at a facet near one end in a direction such that the beam inside the prism orbits around the axis of the prism, reflecting from each facet in turn, six reflections per revolution, and many thousands of revolutions, following a helical path. NOTE: A search on the Internet resulted in the discovery of a more recent paper5 by Mallett in which he calculates the strong gravitational field produced by a photonic crystal in which laser light is caused to orbit in just such a helical path. This is analogous to a right-circular, cylindrical helical coil of copper wire carrying an electric current. When the orbiting laser beam reaches the end of the last facet at the far end of the crystal, a final reflection at the appropriate angle redirects the beam so that it continues orbiting in the same sense or direction, but the helical path now progresses back to the starting end of the prism. At the starting end of the prism, a similar reflection once again redirects the beam back toward the far end, and so forth, ad infinitum. This is analogous to a multilayer coil of copper wire, with the ends connected together, carrying an electrical current. In other words, the laser beam would never be permitted to exit the prism. In this way, after the incident laser beam is turned on, the intensity of the resulting “wall of light” orbiting inside the prism would increase until losses due to photons interacting with imperfections in the prism equaled the power of the input laser. No matter how perfectly transparent the prism was constructed, no matter how free of defects, this balance of input power against output losses would hold true; i.e., we have conservation of energy. At high power levels, these losses imply the generation of considerable amounts of heat, so the title “Firestone” is appropriate. Also, the resulting radiation of large amounts of heat might explain the Cayce reading's reference to the insulating materials, “akin to asbestos,” used in the construction of the dome that housed the Firestone. To permit the prism to run continuously at high temperatures, the material of choice would probably be fused quartz, rather than glass, because of its higher melting temperature, although crystalline quartz might offer interesting possibilities for modulation. Of course, there would also be scattered light issuing forth from all of the facets, turning the room housing the prism into a well lighted place! where h is Planck's constant, c is the speed of light, ν is the frequency, and λ is the wavelength). Ultraviolet lasers could be used if the prism were fashioned of pure silica because silica is relatively transparent in the ultraviolet. Orbiting X-rays or gamma rays would offer even higher energy densities if suitable prism materials and reflecting surface materials could be found. The source of the reading's description of the Firestone includes a capstone that directed an output beam from the prism. Evidently, once the gravitational field is generated by orbiting electromagnetic energy in the prism, it can then be reflected or directed somehow by a capstone. How such a device would function is anyone's guess. The great temple of Incal, called the Incalithlon was shaped like the Egyptian pyramid of Cheops. Within this, and in the most sacred place, was the Maxin. On a raised, triangular platform of red granite, several inches higher than the floor of the auditorium, and thirty-six feet between its points. In the very center of it was A LARGE BLOCK OF CRYSTAL QUARTZ, UPON THE PERFECT CUBE of which rose the Maxin, or Divine Light, a flame of light like a giant spearhead, of unwavering white glow. The great cube of quartz was five and a half feet on all sides. From platform to tip of flame, its height must have been over three times the height of a tall man. The flame made no heat, did not warm the quartz pedestal, was fatal to anyone who touched it; no oil, no fuel, no electric currents fed it; no man tended it. The story of its beginning is given as though it was brought into being by one who was the Son of God. (A) As viewed by an entity separated from the whole, yes. As TRUTH, that may be implied by one that looks only to the Lamb, to the Son as a leader, no. Choose thou. The use of these influences by the Sons of Belial brought, then, the first of the upheavals; or the turning of the etheric rays' influence from the Sun - as used by the Sons of the Law of One - into the facet for the activities of same - produced what we would call a volcanic upheaval; and the separating of the land into several islands - five in number. I assume by "etheric rays" that the source for Cayce's reading was referring to ordinary sunlight, not something mysterious and still unknown by modern science. One might conclude from the fact that the Atlanteans employed sunlight that coherence is not required to produce the effects that they obtained with the Firestone, as described in Edgar Cayce's readings. Indeed, Mallett's paper doesn't suggest that coherence is required. Rather, it seems clear that it is only necessary to put enough light energy into orbit, whether it is coherent, partially coherent, or incoherent. It seems incredible that such a simple physical principle has not already been rediscovered by accident, just as, for example, Podkletnov's7 discovery of a gravitational shielding effect. (See THC's article entitled, The Readings' Anti-Gravity And Ocean-Floor-Gold Predictions Seem Confirmed). If someone did discover this simple principle, she has kept it secret. Not that [this] information may not be asked for, but be sure that the records are read -- and those that have been given may only be read by those who have cleansed themselves, or purified themselves! † The author, John Sutton, is a retired NASA research scientist who holds a Ph.D. degree in physics. At NASA, he designed instrumentation for rocket experiments and orbiting spacecraft. His most recent work involved the design of hypersensitive, infinite bandwidth antennae used for monitoring the Schumann earth-ionosphere cavity resonances and other related phenomena. I would like to thank Edgar Evans Cayce and Craig Spaniol for providing helpful comments on a draft copy of this article. Mrs. Gladys Davis Turner, private communication. J.F.Sutton, “The Tuaoi Stone, an Enigma”, ARE Journal, Jan.1974. Ronald L. Mallett, “Weak Gravitational Field of the Electromagnetic Radiation in a Ring Laser”, Phys.Lett.A 269 (2000) 214-217. W. Hutton and J. Eagle, 2004, Earth's Catastrophic Past And Future, Universal Publishers, Boca Raton, Florida, 572 p.
Mallett, Ronald L., The Gravitational Field of a Circulating Light Beam , Foundations of Physics 33, (2003) 1307-1314. Phylos the Tibetan, 1952, A Dweller On Two Planets, Los Angeles, Borden Publishing Co., 441 pp. Podkletnov, E., and Neuninem, R. "A Possibility of Gravitational Force Shielding by bulk YBA2CU3O7y Superconductor", Physica C 203, 441 (1992).